The results from the surveys, questionnaires and focus groups are disturbing to say the least. Non Christians (referred to as ‘outsiders’) view Christians as, amongst other things; hypocritical, anti homosexual, and judgmental. Much of the book is depressing. But the authors are clear: If both individual Christians and church leaders fail to understand the culture they are seeking to reach, their effectiveness will be minimalised. Furthermore, in talking to outsiders, Christians can discover what they are feeling and thinking. Often what outsiders are hearing is different to what is intended by the Christians concerned. The argument is simple: If Christians want to see progress they must be willing to alter their methods. Take for example, the chapter titled “Get saved!”. According to the research, many young Americans perceive Christians as being insincere and concerned only with converting others. Only one third of outsiders believe that Christians genuinely care about them. Yet most Christians (64%) believed that outsiders would perceive their efforts as genuine. This statistical inconsistency must make Christians re-think both their motives and their methods, the authors claim. The top quality research provokes the reader to ask important questions. If 71% of Christians surveyed cite an individual as directly responsible for their decision to follow Christ, then should evangelism efforts that only reach the masses in a non personal way be re-evaluated? When Christians put on big events or stop people in the street for a one time conversation with no follow up, what messages will people hear? Only one quarter of those surveyed said they are looking for a faith that connects them to God. So when Christians tell outsiders “you can know God”, do they care? The authors don’t want Christians to hide controversial elements of their faith. For example, their chapter on how Christians are viewed as anti homosexual is not a call for theological liberalism. At the same time, the authors point out that Jesus was most likely to offend religious people, not outsiders. While the cross is offensive to people, it should never be the Christian's aim to offend people. While some sections do not translate to a UK audience (Christians here are more likely to be criticised for not being involved in politics as opposed to being too involved) the vast majority of chapters ring true. One of the biggest criticisms of Christians in the research was that they are hypocritical. Rather than challenging these perceptions directly in trying to live a more moral life, some Christians suggest a third way: Admission. Owning up when you get it wrong. While the authors agree this is important, they do not believe it tells the full story. Christian adults identified their number one priority as living a good lifestyle, being moral and not sinning. “Being good” was the primary way Christians defined themselves. One quarter even admitted they served God out of “guilt and obligation rather than joy and gratitude”. The authors conclude by stating “our passion for Jesus should result in God-honoring moral life-styles, not the other way around”. Yet outsiders view Christians as being over-obsessed with morality, so much so that rules are all they have to offer. The cart is being put before the horse. At the same time younger Christians have a more relaxed attitude to morality. David Kinnaman writes: “It pains me to discuss this research, because it is not flattering to young people in churches, yet we have to be realistic about the life being portrayed…Young people – even in churches – are reshaping moral and sexual rules. This gives the UnChristian perception even more potency, because many young believers are living out their Christian faith with enormous laxity. As well as sharing his own thoughts from the research, David has invited Christian leaders such as John Stott, Mike Foster, Brian Mclaren, Louie Giglio and Chuck Colson to comment. The book will not be without its critics. One of the main issues some will raise is the focus on the pragmatic. Some will suggest that Christians should only focus on finding Biblical methods and not worry about fruit (or lack of it) as only God can see what is truly happening in people's hearts. This argument will see little to no purpose in surveying outsiders and discount the book as meaningless at best and a waste of time at worse. While the authors would agree that Biblical methods should be applied to evangelism, they are also unapolgetically pragmatic. Ultimately, the question boils down to how much you're willing to let outsider's views on evangelism influence your own methods. Can you follow biblical teaching while also examining outsiders views of these methods to see what could be adjusted? If you think this is possible to do without compromising the gospel, you'll love this book. UnChristian may not be the most positive Christmas present for your church leader, but it will definitely be one of their most useful and helpful. Written in an accessible style, the book is easy to dip in and out of. Church leaders and individuals will find plenty of thought provoking material. For those willing to read the 250 pages with a pinch of salt to allow for the difference in US and UK attitudes, the rewards will come at quite a pace. Reading with humility will result in learning plenty. 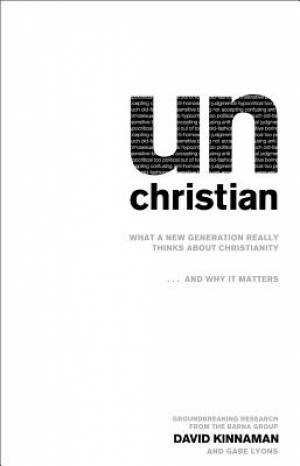 UnChristian is not, for the most part, about changing theology. It's about re-thinking our practises. When 70% of 16 to 29 year olds view Christians as insensitive to others, questions have to be asked. This book doesn't just raise the questions, it provides some excellent answers too. The problem is that it is usually the views of traditionalists or ultra conservative Christians that are broadcast or debated. it is a pity that other widely held views from progressive, liberal and inclusive Christians are not as newsworthy!! !